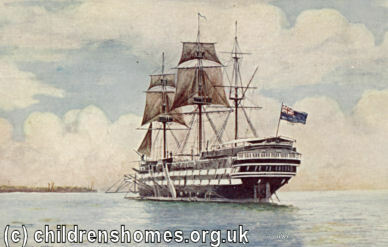 The Warspite was lent to the Marine Society by the Admiralty in 1876 for use as a Training Ship for boys. 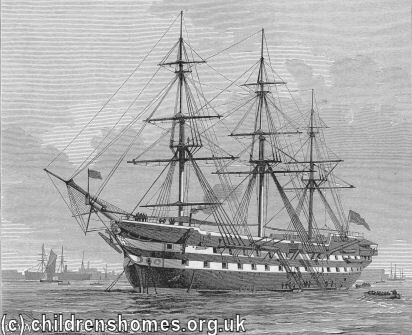 The vessel, which was anchored off Woolwich, Kent, had accommodation for 500 boys. 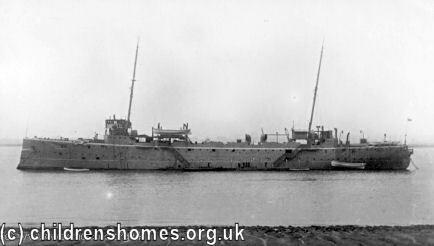 A yacht was attached to the ship, and a shore establishment included swimming baths, hospital, laundry, storehouses, etc. 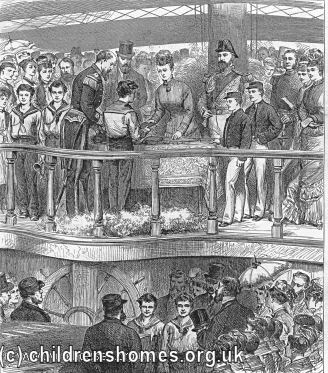 HRH Princess of Wales presenting prizes to boys on Warspite, 1877. In 1911, boys were admitted between the ages of 14 and 16½, with a minimum height of 4ft. 11in. without shoes. They were required to be of good character, and to go to sea at the end of their training. They also had to sign indentures for 2 years from date of admission. The only payment required was a fee of £15 on the boy's admission. In 1911, the Captain Superintendent was Captain W.H.F. Montanaro, R.N., and the Secretary was Lieutenant H.T.A. Bosanquet, R.N. The Society's offices were at Clark's Place, Bishopsgate St. Within, London. On 20th January 1918, the Warspite was destroyed by fire. Three of the inmates — Harold John Wesley Gurr, 14; Frederick Blogg, 15; and Ernest Cecil Adams, 14 — subsequently admitted having set fire to the vessel and were each committed to a reformatory for three years. After the blaze, the Warspite lads were transferred to the nearby Worcester. The Marine Society approached the Arethusa with a suggestion of amalgamation but was turned down. Subsequently, the old Warspite was replaced by the cruiser Hermione which took on the Warspite name and carried on in competition with the Arethusa. The ship was finally closed in 1940, although the Marine Society continues to this day.